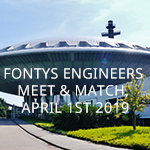 Only 2 more weeks to go, before Fontys Engineers Meet & Match takes place on April 1st from 9.30 – 17.30! Adimec is looking forward to connect with the Fontys Engineering-students. During this day students are invited to meet Adimec in 15 minutes speeddates. A good internship match could be the result of this meeting. Also interested to learn more about job opportunities at Adimec? You are welcome to meet us during this event. Please visit our career page in preparation for this day. We are waiting for you!